San Francisco, October 2, 2018 — As hoteliers begin planning their 2019 budgets, they will be focusing in part on implementing technology that will help their deskless employees better communicate with management and each other. 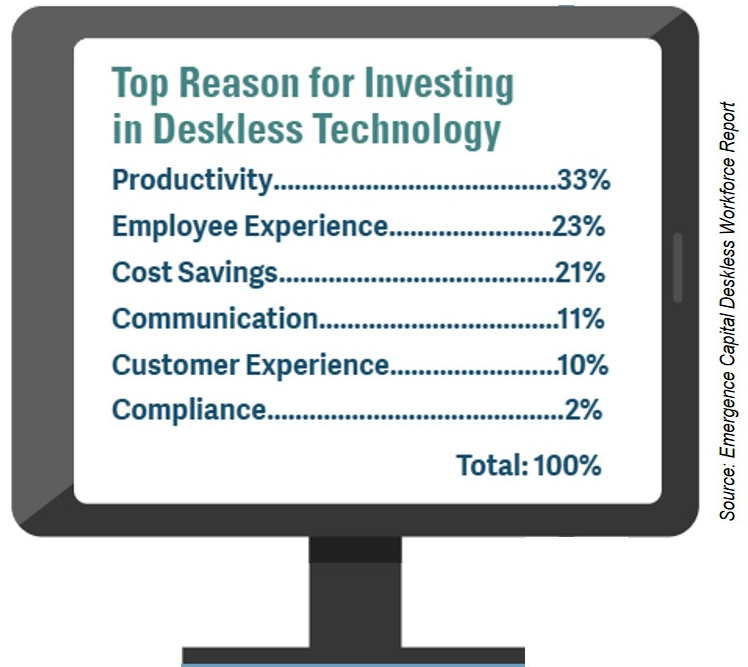 Eighty-two percent of hospitality companies plan to increase spending on deskless technology in 2019, according to a new deskless workforce report issued by Emergence Capital. “The Rise of the Deskless Workforce” shows that hotel companies will direct part of their spending to ensure they are connecting with employees in hopes of increasing productivity and keeping employees happy. With 98% of companies using mobile platforms such as phones and tablets to communicate with employees, according to the report, hoteliers lagging in engagement will risk losing employees to the competition or other industries. The best way hoteliers can engage their deskless employees and get them to embrace a hotel’s culture is to connect them digitally to the organization. Linking employees across locations and departments in real time via mobile or desktop devices will keep each person wanting to learn more about the company … their department … VIP guests who may be arriving that day or that week … a new hire … an incentive contest … or even a new corporate policy. Digitizing the workforce will help companies improve internal communication and streamline business processes. It’s an ideal way to connect non-desk workers to company news, updates and protocols; share crisis communications messaging; onboard new hires; and motivate existing employees and share their achievements. In other words, it keeps employees connected to management and each other. In the past year, Fortune 500 firms across the globe have adopted Beekeeper as their workforce communications platform. Named the Most Innovative Technology of 2018 by HTNG, the “People’s Choice” by HFTP, and ranked No. 59 on the SaaS 1000, Beekeeper has been busily increasing its user base this year by more than 500% and is currently being used in more than 137 countries worldwide. Engages employees at a basic level and gives them a voice. Rewards employees for doing something good. Creates loyalty and drives job retention. Makes employees feel a part of something important. Beekeeper is digitizing the non-desk workforce by connecting operational systems and communication channels within one secure, intuitive platform. The solution connects colleagues across locations and departments in real time via mobile or desktop devices and includes an intelligent analytics dashboard to help companies improve internal communication and streamline business processes. Secure, automated, and relevant information is readily distributed, searchable, and measurable in one central hub for an efficient digitized workflow. – Human Resources Director Rhonda Turner, Feather Falls Casino, Lodge & Brewing Co.
53% of HR professionals say employee engagement rises when onboarding is improved (Source: SilkRoad).